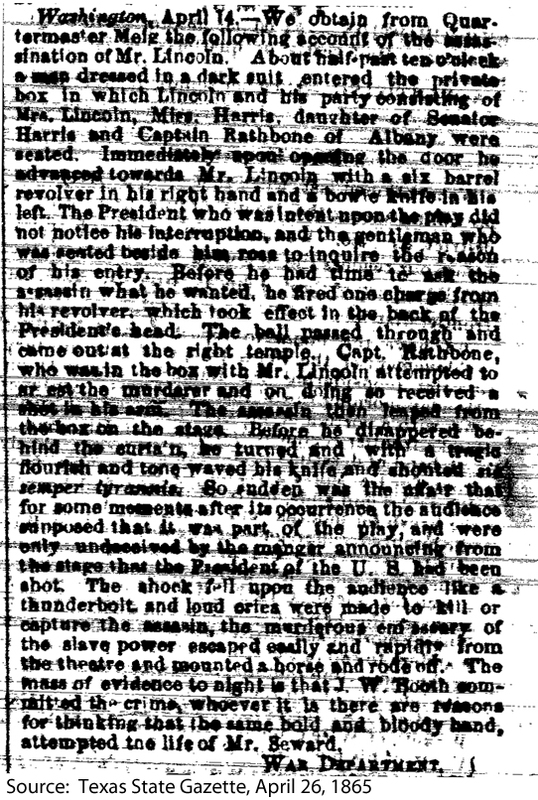 A short account of the assassination of President Lincoln. Details are given as to the sequence of events and the actions of the shooter, who is named as J.W. Booth. We obtain from Quartermaster Meig the following account of the assassination of Mr. Lincoln. About half past ten o'clock a man dressed in a dark suit entered the private box in which Lincoln and his party consisting of Mrs. Lincoln, Miss Harris, daughter of Senator Harris and Captain Rathbone of Albany were seated. Immediately upon opening the door he advanced towards Mr. Lincoln with a six barrel revolver in his right hand and a bowie knife in his left. The President who was intent upon the play did not notice his interruption, and the gentleman who was seated beside him rose to inquire the reason of his entry. Before he had time to ask the assassin what he wanted, he fired on charge from his revolver, which took effect in the back of the President's head. The ball passed through and came out at the right temple. Capt. Rathbone, who was in the box with Mr. Lincoln attempted to arrest the murderer and on doing so received a shot in his arm. The assassin then leapt from the box on the stage. Before he disappeared behind the curtain, he turned and with a [illegible] flourish and tone waved his knife and shouted [si semper tyrannia]. So sudden was the affair that for some moments after its occurring the audience supposed that it was part of the play, and were only [illegible] by the manager announcing rom the stage that the President of the U.S. had been shot. The shock fell upon the audience like a thunderbolt, and loud cries were made to kill or capture the assassin, the murderous [illegible] of the slave power escaped easily and rapidly from the theatre and mounted a horse and rode off. The mass of evidence tonight is that J.W. Booth committed the crime, whoever it is there are reasons for thinking that same bold and bloody hand, attempted the life of Mr. Seward. Use of this item for research, teaching and private study is permitted with proper citation and attribution. Reproduction of this item for publication, broadcast or commercial use requires written permission. 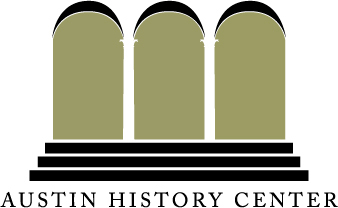 For permission, please contact The Austin History Center at ahc_reference@austintexas.gov. For reproduction information please visit http://library.austintexas.gov/ahc/ordering-photos.